How score is determined – (Fighters are given 10 points for a first-place vote, nine points for a second, etc., down to one point for 10th place. The results are then tallied up and presented here. Official SB Nation rankings policy: Fighters under commission suspension are ineligible to be ranked during the duration of their suspension or if they have licensing issues. 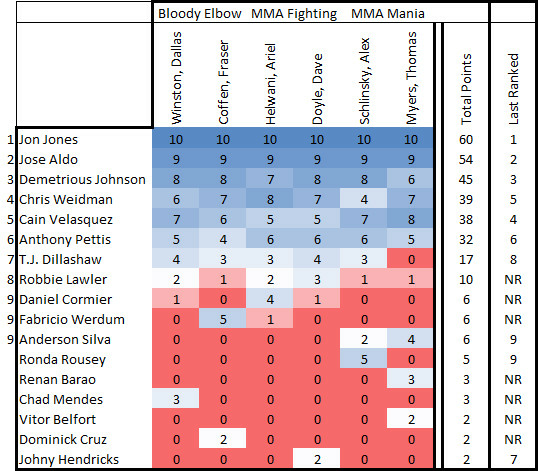 As of this writing, this does not affect any fighters who would generally be considered pound-for-pound top 10-worthy. Jones remains eligible as he was not suspended by the Nevada Athletic Commission for his recent out-of-competition test).